Three mic inputs and two speaker jacks. Cardioid Dynamic Mic with flexible gooseneck. 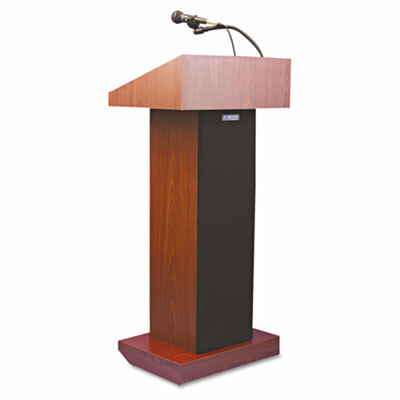 Executive style lectern built from solid laminate construction includes storage space and sculpted radius base. Powerful 50 watt amp for coverage up to 1,500 people or 15,000sq. ft. High-performance amplifier includes 3 mic inputs and two speaker jacks to accommodate CD/tape players and computer inputs. Two built-in 6 x 8 inch speakers to reach any area of the room. Superior Cardioid Dynamic Mic with flexible gooseneck to accommodate any speaker.